The Life of the Land Have You Ever Known a WWOOFer? Kohala Goldsmiths Lahaina Galleries Third Dimension Gallery Peter Lik Gallery ... and more! 68-1330 Mauna Lani Dr . Kohala Coast, Hawai’i 96743 . 808.885.9501 www.shopsatmaunalani.com . www.thegreat4Dmovieride.com . When Heidi White slips into the warm waters of the Kona coast at the crack of dawn, watching the sun crest over the top of Hualalai mountain, she isn’t alone. “The oceanfront home owners see my regular routine, and often they’re in the water with me!” she says. A few of the Big Island Team members. As an agent for Hawaii Life Real Estate Services, she begins almost every day on her stand up paddle board, relishing her own Hawaii lifestyle before going to work to help others enjoy the same. Hawaii Life was born in June 2008 out of the realization that real estate had been completely transformed by the Internet. Today, Hawaii Life has expanded to six islands, has over 60 agents, lists 148 homes, and has conducted over $43 million in sales. Thousands of people visit www. hawaiilife.com everyday. Puako – home for BIC Katie Minkus and Hawaii Life. Beth Robinson Specializes in North Kohala Life. world has radically changed. One of those small changes is that everyone, including my 75 year-old friends, travel with laptops. Hawaii Real Estate bargains sell fast, so you learn to move fast with them.” For more information about Hawaii Life’s real estate services, go to www.hawaiilife.com. Heidi embodies her agency’s innovative approach to real estate: “We are un-corporate, local, forwardthinking. We embrace technology— while maintaining a strong human connection to the buyers and sellers we represent,” says Principal Broker Matt Beall. Experience your pet deserves, experience you can trust. Celebrate your love of the Big Island with a one-of-a-kind jewelry creation. Wrinkles due to sun damage can be prevented and minimized. Chronic exposure to Hawaii’s sub tropical sun creates a host of skin damage scenarios. According to recent research, the profound effects of exposure to ultraviolet light account for up to 90 percent of the symptoms of premature aging. Add that to Hawaii’s location just south of the Tropic of Cancer, and people receive even more sun damage due to higher, more intensive UVA and UVB radiation. The good news is that many innovative treatments and procedures are now available to prevent, fix and reverse this damage, leaving your skin more youthful looking and radiant. How excessive sun exposure causes wrinkles. chronic sun exposure. Over time, the skin’s natural ability to repair itself becomes compromised, leading to wrinkles, as well as sagginess, sallowness and brown spots. There is hope. Innovative treatment options for wrinkles. To prevent wrinkles, use sunscreen liberally. To reverse damage already done, get on a good skin care regime such as Obagi’s Nu-Derm that includes products containing Retin A (proven to stimulate the growth of collagen) and topical anti-oxidants. Patients can opt for laser resurfacing with the help of the Fraxel laser or the newer Active and Deep Fx fractionated laser for faster results. A complimentary VISIA complexion analysis, along with a detailed individualized treatment plan to help you achieve your anti-aging goals, comes with every consultation. Visit our Web site today to view educational videos and read more about the various treatment options for addressing wrinkles caused by excessive sun exposure. Call today to schedule your appointment. It’s time to reverse the effects of sun damage on your skin. Four Specially Priced Packages. For treatment of wrinkles, we have bundled up just what you need in four, non-surgical packages. These combine laser skin resurfacing, injectables (including Radiesse, Perlane, Restalyne, Dysport and Botox), as well as products from the renowned Obagi Skincare line and more. Choose the one best for you. Four packages, four prices. Visit www.DrJohnStover.com/wrinkles2 for all the details. John D. Stover, DDS, MD, PhD Board Certified in Facial Cosmetic Surgery and Oral and Maxillofacial Surgery, Dr. Stover is one of the most highly trained and imminently qualified cosmetic surgeons in Hawaii. Dr. Stover continually updates his knowledge, skill and practice in the latest surgical and non-surgical procedures and techniques. Marné CarMichael Walsh, M.S., PAC, Physician Assistant Physician Assistant Ms. CarMichael Walsh teams with Dr. Stover to perform treatments that address wrinkles and other effects of sun damage to the skin. Ms. Walsh was educated at U.H. Manoa and at the Chicago Medical School and is a board-certified Physician Assistant. The life of the land is perpetuated in righteousness. [Its sustainability depends on doing what is right.] Proclamation by Kona-born King Kamehameha III in 1843. Later adopted as the state motto. Green with Envi is in the Malama Pono Building (how appropriate!) across from the Shell gas station in Waimea. But, wait….. here’s the punchline. This month Tahiti also graduates from high school!.... And she just turned 18. Yes, that’s right. No typo here. Here’s to a successful launch into the next chapter of her life. We wish her many more decades of success. In this issue of Ke Ola, we share stories of other young adults who are being given a chance to follow their dreams on our special island. Those with a passion for learning to grow food organically come here each year to volunteer with the WWOOF program (Worldwide Workers on Organic Farms). Hadley Catalano profiles a few of them in her story, “Have You Ever Known a WWOOFer?” Find it on page 24. A dream of becoming a professional dancer may also come true on the Big Island, with Angel Prince sharing her passion for contemporary dance with students and the community. See “Angels of the Dance,” Kim Cope Tait’s story beginning on page 14. The vast Pacific Ocean (moana) surrounds us with life and vitality, nurturing us and our island paradise. Fine art photographer Victoria McCormick, with writer Marya Mann, (page 19) and Kumu Keala Ching (page 11) remind us of how important it is to honor and protect this lifeline. ✿ I was so inspired by the story of the master drum maker that I decided to get into native American music. I was gifted with my first flute on a recent visit to the Big Island. It’s a High Spirits flute, and easy to play. I am now pursuing the ancient art of making music with an authentic instrument. Keep on inspiring your readers with excellent stories of craftsmanship and skill. it’s working! Sincerely, – Barrie Byron, Lawrenceville, NJ and Boynton Beach, FL ✿ The March/April issue of Ke Ola magazine was confirmation that I am home here in Kona. It was trippy to see how many people I knew. I mailed a copy of this issue to a friend in New Mexico, two people in California (friend and granddaughter), and my mom in Washington. Each copy was filled with sticky notes identifying people I either know or have heard of and places I have been to. This doesn’t include the list of advertisers where I know the owner or manager. I bought a pahu drum from Uncle Kala when I first moved here and took a hula workshop where Aloha Victor was one of the teachers. Thank you for this beautiful magazine, which is filled with good mana and an abundance of Aloha. Cover Art: “Guardian Ancestors” Fine Art Photograph by Victoria McCormick www.victoriamccormick.com "The Life"
There are lots more stories behind the stories, and now you can participate by making frequent visits to our website. There is so much more to share, as well as give you a forum to talk story with other readers and submit ideas for future articles. Become a fan on Facebook, follow us on Twitter and connect with us on LinkedIn to find out the latest from Ke Ola! We love staying in contact with you! How rich is a world and a community with all ages of its inhabitants participating and being appreciated. This brings to mind Henry, a gentleman who applied for a position in advertising sales at a newspaper Karen published in another state. He enjoyed talking with business people and helping them with their ads. He was 87 at the time. After suffering a stroke at age 92, he retired. These stories remind us it’s never too early and never too late to live our passion in life. Nancy Sweatt of Kailua-Kona (pictured on the right in the photo) writes: “My mother, Barbara Sweatt, keeps her Ke Ola magazine on the coffee table in her formal living room. She loves to show it to everyone who comes to her home. It is a fabulous conversation piece on cold Minnesota days. She and her friends reminisce about their trips to Hawai‘i or dream of the day when they return to the tropics, swaying palm trees and Hawaiian music. She loves to see what is happening in Kona. When I call and say I went to an event, sometimes she will say she read about that in Ke Ola. She feels more connected to my life here in Kona, thanks to Ke Ola.” The photo above shows Barbara and Nancy Sweatt in front of the depot in Wayzata, Minnesota. Send us your photo of Ke Ola, taken somewhere around the world. ✿ People don’t really understand the magic of the Big Island until they’ve lived there. There’s a soft beauty there and a passionate wildness. It’s something that stays inside you, regardless of where you live. And once you’ve moved away, it’s a constant longing to return. 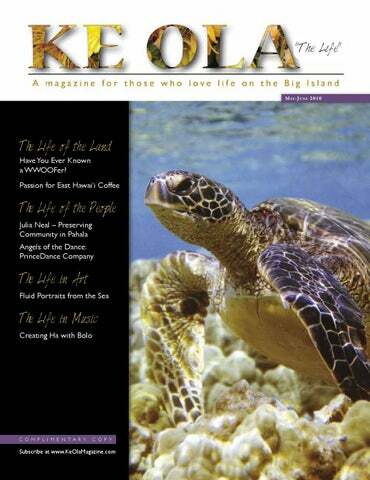 Thanks to Ke Ola magazine, I get a bimonthly serving of the Islands Aloha Spirit, even in Baltimore, Maryland! CORRECTION: In the March/April, 2010, issue of Ke Ola, the beautiful photos accompanying the article titled, “More Than a Wooden Big Top: Soaring High at S.P.A.C.E. in Puna,” were taken by photographer Allison Erickson (www. allisonerickson.com). We neglected to give her credit. Mahalo, Allison. For reservations and program information, call 808-324-2540. Nancy Emery, a Family Nurse Practitioner, is an advanced practitioner of Cranio-Sacral, Lymphatic Drainage, and Heart Centered Therapies, emotional, energetic and intuitive medicine. She uses alternative therapies that empower people to care for their physical, emotional and spiritual health. oc” McCoy was never one to turn people away and enjoyed giving back to the community of Kona and to the State of Hawai‘i. Before Hawai‘i was a state, Dr. Kid McCoy was appointed the Territorial Deputy Veterinarian in the District Of Kona, where he served for many years. It was after this, in the 1960s, that he started Keauhou Veterinary Clinic in his own, large home. Nestled on the slope of Hualalai out on the edge of town, on Walua Road, Doc McCoy’s vision and foresight brought a new dimension to veterinary care for the island. “Doc” McCoy saw everything from cows, pigs and chickens to horses, cats and dogs, serving as one of the veterinarians for Parker Ranch. People tell stories of waiting outside his clinic for him to come out and look things over, giving a shot for this, a prescription for that and everything in-between. He was a kind veterinarian and honest to a fault, a model of his profession and everything that it embodied. In 1962, along with retired Konawaena school principal Mark Sutherland, McCoy started the Kona Chapter of the Big Island Assoc. to Help Retarded Citizens; which today is The Arc of Kona. He also worked with the area’s young men and women encouraging them to continue their education. Dr. McCoy knew early on to think out of the box. He was ahead of his time. When he passed away in 1991, “Doc” McCoy left a legacy behind him, one that has carried forward to the 21st century and beyond. The veterinary practice he started has continued to live on for another 47 years and counting. Keauhou Veterinary Clinic has had a few owners since those early days, remaining in the same building where Dr. McCoy lived and practiced. Originally built as a residence, the clinic and surgery facility now occupy the entire house. Built in 1963 by Yukio Yamamoto, the post and beam construction is made from koa and ‘ohi‘a. The sloping roof and the architectural details were a beautiful contrast to traditional Hawaiian-style homes in the area. The hand-carved, strong beams spanning over 30 feet are a sight to behold. With hand-crafted metal plates, they have kept the structure in place for many years, through earthquakes and storms. People who remember working on the building often recall stories from that time. Forty-seven years later, the same lanai greets clients of the Keauhou Veterinary Clinic, under the care of Dr. Jacob Head. The covered lanai of the McCoy house, built in 1963, using post and beam construction with koa and ‘ohi‘a, offered a congenial setting for friendly gatherings at the home of the wellknown Kona veterinarian. The house doubled as a clinic in those days. previously invisible objects, the weight of which, earlier in her dance, threatened to topple the wide-eyed girl beneath their multi-colored nest. The number is about the precariousness of being human, the longing to be good—to be real. How we discover balance, almost as if by accident. Find a way to forgive ourselves our imperfections—love them into the layers of our beauty. When the dance ends, the audience for this special fundraiser event applauds and listens attentively, as Elizabeth breathlessly describes what it means to her to have the opportunity to get paid for doing what she loves—here in her island home. Having danced for Angel Prince since she was 14, a girl who balanced her stageworthy endeavors with the act of communion with her Honoka’a home and surfing in Waipi’o Valley, Elizabeth is completely comfortable on the Kahilu Theatre stage, where Angel has served as the resident choreographer since 2007. Teacher, dancer and choreographer Angel Prince brought this opportunity for Hawai‘i youth to the Big Island after a decade of working on the concrete island of Manhattan. She moved to Honoka’a in 2003 in search of the kind of grounding, creative force that underlies the Hawai’i Island experience and is consummate in its patron goddess Pele. It is Pele’s transformative energy that Angel honors and perpetuates with her innovations in dance; that energy pervades this ever-growing isle, infusing its many landscapes with the promise of growth and expansion, while honoring what is sacred and ancient in the Hawaiian tradition. In 2005 Angel began the PrinceDance Institute, which was and continues to be a for-profit institute that offers classes to all ages in contemporary, ballet and partner dance and results in regular shows for the community and beyond. Angel’s intention for the institute is to fuse what is most vibrant and inspiring in contemporary dance with the sense of honoring the land we inhabit. Each of the institute shows has centered on environmental awareness, and from hailing sustainability to cautioning against global warming, the message of nurturing and protecting the ‘aina is central to Angel’s vibrant and theatrical productions. Elizabeth and her cohort Lia Cain have clocked countless hours on the black stage of the Kahilu, moving and dancing, laughing and creating under Angel’s tutelage. Having started in Angel’s institute, they are now the principal dancers in the new, nonprofit PrinceDance Company. Like Elizabeth, Lia is a Honoka’a girl, and the contrast between her short-board-riding persona and the one that graces the watery ‘stage’ at the PrinceDance fundraiser at a private residence in Waimea is delicious. onContinued page 17 Angel Prince, founder of Prince Dance Institute and the new PrinceDance Company. Photo by John Russell. In between dinner and the toast is a Tango interlude involving Angel herself and Hugo Patyn, a professional dancer she has brought in from Buenos Aires, especially for the PrinceDance premier. The two are intensely synchronized, locked at the eye, the foot, the hip. The audience considers looking away from what must certainly be a private intimacy, but is drawn in again by the irresistible beauty of their figures moving across the floor. They are reassured at intervals by Angel’s candid and seductive little looks in their direction, daring them to hold their ground; Hugo’s eyes, in comparison, never leave the fluid body of his partner. Angel’s stiletto heels find their way around and between Hugo’s black dancing shoes, and the two dancers ignite the room, bloom into the unmistakable flame of tango, and remind us again of the thrilling danger and the fabulous appeal of moving in unison with another human being. many consider to be a cultural revolution. “There is a cultural history there that hadn’t really evolved for 100 years. The youth of Argentina have rediscovered it and are building on that history with a fresh, young eye,” says Angel. Continued from page 15 of a spotlight projected onto rock. The result is mind-bending: Here is darkness and light. Distance and proximity. Stone and sky. This canopy of connection—inky membrane between us. Within and beyond: the frenetic movement of what we desire, what we resist, what we create every minute. With our intention we expand into that space, push at the membrane as if against gossamers, find one another with our flesh. With our fear, we recede, pull into the heart of our individual space—allow the night to drop down on our heads, fill the space that threatens to close, seal us to each other. What strikes me, as the dances end and the donations to support this growing, alive, artistic endeavor here on our own beautiful island begin to come in, is what it means to be able to stay. So often our youth feel forced to leave the islands in order to spread their prodigious wings. They find, as they grow and discover their own talents, that their Big Island home can be limiting. For what it is, they love it. Their family is here. In this place they have grown to love the connection to earth and element—the very connection, in fact, that first drew Angel to live and work here. In this place they have learned to be rooted but also to aspire to great heights, to limn the ethereal with their own burgeoning spirits, while their toes draw spirals in the black sand. Elizabeth is in earnest when she says that Angel’s creation of the PrinceDance Company has changed her life. That without the rooting of Angel’s artistic Kids on sta ge in the sh ow “Vis Viv Theatre. Ph a” at Kahil oto by Kan u oa Withing ton. purpose here in North Hawai‘i, her dream would have, of necessity, sent her away from the home she loves. She and Lia glow with the excitement of yet another night on stage, in the spotlight, where they will bask in the approbation of another enthusiastic audience…and then go home to their Honoka’a beds, wake to the sounds of the myna birds outside their windows, grab a hot malasada (shhhh, don’t tell Angel!) and head on down to the shoreline with their surfboards. To see Angel’s class schedule and get more information on upcoming Institute shows and events, you may want to visit the website at www.princedanceinstitute.com. To see more about what is happening with the new, nonprofit PrinceDance Company, visit www.princedance.org. Email Kim Cope Tait at kimcopetait@hotmail.com. And then there is the decision. To stay and give up the dream of being a professional contemporary dancer, actor, singer…or to go. Go in pursuit of the thing that lights them up. The thing that expands them into their best possible selves. In their hearts: the hope of one day returning… and a deep sadness for what must be abandoned in the interim. “Balancing Act” with Elizabeth McDonald. Come, swim where the dolphins play. Journey aboard the Dolphin TLC to swim among dolphins in their natural habitat, the beautiful Hawaiian waters. eavenly light filters through the ocean surface into the underwater world, birthplace of life on Earth. Her images, far Paul and from two-dimensional, Victoria	McCormick express her passion to save the world’s oceans and share the spiritual values of Hawaiian culture, giving us depth, beauty and delicious hope. Fine art photographer Victoria McCormick slips into this liquid womb of coral reef and eagle rays, swimming in gentle accord with ancient creatures, bringing back some of the most dazzling images of marine life ever recorded. “I take tens of thousands of photographs,” she says, “using only natural light. ” To get the most evocative views, she learned to be so non-threatening that a Florida manatee once kissed her and a sooty tern felt safe enough to dance playfully on her head. Continued from page 19 In the ocean depths, whistling songs partner with rainbow visions, plankton with algae, coral with crustacean, delighting us with the exuberance of life and the sharpness of sudden death, all in perfect symmetry. Unfortunately, with human pressures on our oceans intensifying, no one knows if the balance of this undersea dance can last. Camp Erin-Hawaii is a weekend overnight camp for kids and teen, ages 5-17 who have experienced the death of a loved one. Facilitated by professional staff and trained volunteers, Camp Erin is offered to families free of charge around the Big Island of Hawaii. At Camp Erin-Hawaii, kids have an opportunity to be around other kids who have experienced similar losses. They participate in typical camp activities (archery, arts & crafts, field games, hiking and more), as well as activities designed to help them understand and process their grief. Parents also engage in self care activities, learn about grief, find ways to cope with their own grief as well as support their children. any laser or facial treatment for both of you! We also carry Revitalash eyelash conditioner, for longer thicker lashes. Such affinity has also given her cause for concern. Spotted eagle rays are considered “NT,” or near-threatened, by the International Union for Conservation of Nature (IUCN). Revered by Hawaiians since ancient times as ‘aumakua, “guardian spirits,” honu have been swimming the oceans for millennia, living the turtle dream. Fossils 180 million years old show that Hawaiian sea turtles lived through the age of the dinosaurs and survived the age of ice. “In the summertime when the sun is at its highest, some adult females and most of the males begin their ocean journey back to the Northwestern Hawaiian Islands’ nesting sites,” says Victoria. Some swim more than 800 miles from feeding grounds in the main Hawaiian Islands to their NHIM nesting sites. Victoria’s photo, “The Journey Home,” considered her signature work, illustrates the awesome glory and unity of ocean, air, land and animal life. One Phone Call Could Change Your Life Forever! There were once several million green sea turtles worldwide. Today, fewer than 200,000 nesting females remain. In Hawai‘i, only 100 to 350 females nest each year, predominantly at French Frigate Shoals in the Northwest Hawaiian Islands chain. The IUCN (International Union for Conservation of Nature) Red List lists all seven species of sea turtles as threatened or endangered. While they are making a comeback, Hawai‘i’s honu are still very much in danger. Sea turtle shells are used to make jewelry, their skin to make leather goods, their meat and eggs for food and their fat for oil. translated by Queen Liliuokalani, marks the evolutionary progression of living creatures from heavenly light to the oceans to the land. Like the creation chant, Victoria’s photos reveal secrets from the depths of time. With their sapphire blues, opulent teals and emerald greens of honu, monk seal, spinner dolphin and humpback whale, her images conjure the scent of salty sea air and remind us the oceans deserve our deepest reverence. What is the song of the ocean now, we ask? Humankind has altered the ocean through fishing, agricultural runoff and litter—including plastic bags, lighters and net debris, but the major threat to oceans is global warming. When water overheats, it bleaches algae from the electric-colored coral reefs and obliterates essential food sources for all sea life. New thinking and new actions, though, can reverse the trend and prevent us from destroying the honu, the eagle ray, and the albatross, as well as ourselves. Our lives are deeply connected to the sea. Every time we draw a hot bath, enjoy a seascape, or snorkel in the wonderland of riches within the ocean, we take steps in this dance of life along pathways connecting the hydrodynamic commonwealth of our planet. ana Ronnquist had always been interested in permaculture and organic farming. Growing up in Westchester County, New York, an hour outside the city, the 24-year-old hadn’t had the opportunity to get hands-on experience in what she felt was the only way to truly understand where food comes from and how it grows. It’s a grubby job—Rachel Stedman works with worm composting at Hoku Farm in South Kona, owned by Diana Duff. organic farms, signed up and paid the nominal fee to join WWOOF. Jessica Hildreth is layering brown lettuce leaves in coffee fields on Hoku Farm to help moisturize the soil. Continued on page 27 Above: Sarah Obellianne, weeding at Hoku Farm. At right: Jessica Power puts lettuce in boxes at Keala`ola Farm. It’s true that volunteers are literally helping small farmers survive. Duff commented that the volunteers have been extremely helpful, as she holds three jobs and has found it challenging in recent years to keep up with her three-acre, organic farm. She explained that she has taken on a more managerial role, instructing the incoming volunteers in daily farm tasks, such as weeding, planting, pruning, harvesting and preparing for market. Royal Hawaiian Heritage Jewelry brings you the timeless legacy and beauty of Hawaiian Jewelry. Specializing in Hawaiian Jewelry, plumerias, diamond & Black Tahitian Pearls. Each piece of our custom engraved Jewelry is a one of a kind piece of art to be handed down from generation to generation. ***Show us this ad to receive FREE Bracelet with purchase Expires July 31, 2010. Continued from page 25 couple from North Dakota wanted to learn how to farm on the Big Island. Qigong center and cancer recovery retreat center that started its farming intern program six years ago. The 20-something couple chose the farm at Keala`ola from the networking catalog because it offered a good community living experience: a large, shared community kitchen; outdoor shower facilities; a hilltop row of tents with tarp coverings overlooking the lettuce patch; and suitable hour/work exchange, 20-to-30 hours a week with weekends off. Though never having farmed before, they quickly adapted to the Keala`ola lifestyle and found themselves easily catching on to the daily tasks of planting, harvesting and general farm maintenance. Fellow apprentice Jessica Powers, 25, of Cape Cod, Massachusetts, had heard about the lettuce farm from a friend after WWOOFing on various farms from New England to the West Coast. “I wanted a smaller farm with more hands-on experience and responsibility. I wanted to learn more about farming in different climates,” said Powers, who resumes a leadership role when one of the owners is away, like filling out order forms and figuring out what needs to be done. “This is a great place, great people. I have taken in a whole new experience and learned a lot about building relationships and the importance of communication on a farm.” For Kotner, who started volunteering on farms in Portland, Oregon, in the early ‘90s with the first wave of organic helpers, the process has come full circle. Housing for workers on Keala`ola Farm. Having been on the island for 11 years, Whitney grew up working on dairy farms in Southern California and vineyards in the Central Valley, behind the tutelage of his master gardener mother. The Life OF THE PEOPLE The restored sugar plantation manager’s house now welcomes the community and visitors. hen the Pahala Sugar Mill closed in 1996, after 135 years as the town’s major employer, the village of Pahala in the Big Island’s southern district of Ka`u went quiet. Some folks moved, but many local residents stepped up and bought houses, including larger homes on manager’s row. It was a unique situation, without a rush of outside investors scooping up houses to gentrify the town. In the midst of this change, one of the houses left without a steward was the biggest—the huge, plantation manager’s house. Julia had moved to Kona from Kaua`i just before Hurricane Iniki hit in 1992, after a career at The Garden Island newspaper, where she served as its editor. She moved to Hawai`i Island in part to launch the visitor guide Big Island Gold, writing, photographing and setting up its accounts and circulation. She also became the marketer for the Captain Cook and Adventure V cruises. While living in Kona, she took on publishing and editing the Mahalo Air inflight magazine. With the first direct Japan Airlines flight to Kona, she started the Japanese visitor publication International Guide to the Big Island, now in its 14th year. Always busy, she sought to get away to a peaceful place and found Pahala, where she met furniture builder Michael Worthington, who also traveled to the village to retreat from his own busy life in Kona at Worthington Woodworks. The couple began driving to Pahala together—ultimately buying their first home in 1998. Julia Neal and Michael Worthington lived just across the street, where they could see the shutters flapping and paint peeling. After the plantation manager left, the stately house, built in the early 1900s with solid ‘ohi‘a floors, had briefly served as a drug and alcohol treatment center and now was vacant again. Julia has an inherent interest in preserving both Hawai`i’s rich and diverse culture and its historical buildings. While living on Kaua`i, she helped collect oral histories for the National Endowment for the Humanities and helped to get a number of sites listed in the State and National Registries of Historic Places. In The Garden Island newspaper she ran a weekly column on historic buildings. These experiences with plantation history prepared her well for her life in Pahala. Continued from page 29 and walking into the home of an ancestor. Unpretentious (a word that also describes its owner), it is expertly furnished for the era, with beautiful wood floors, period artwork and china cases full of chochkes—each one an antique with its own unique story. It’s like a living history museum where groups can stay overnight and you can touch anything. You Don’t Have to Face Your Sorrow Alone We’re Your Home Town Funeral Home. As Julia and Michael restored the house, they involved community members and invited everyone in. “I’ll never forget a man who brought his mother in a wheelchair for a tour”, says Julia. “She was 90 years old, lived in Pahala her whole life, and had never been inside the house. Now I’d be surprised if you could find anyone in Pahala who hasn’t been there. The house is used by neighbors for weddings, graduations, baby lu‘au, community meetings and when they have family visiting,” explains Julia. Perhaps Pahala was saved from rampant tourist development because of its remoteness and its lack of the sandy beaches, calm snorkeling waters and waterfalls that usually attract the mainland buyers, Julia says. In this isolation, former plantation workers have had time to adjust to a new economy. The impact of the shutdown of sugar mills was great, but they were able to keep their families intact and help direct the future of their own community. With the perfect growing conditions and harbors at Na`alehu and Honu`apo, Ka`u provided the ideal conditions for Hawai`i’s sugar industry. So vast was its hold over the islands that at one time, one of every 12 persons employed in Hawai`i worked in the industry. In Pahala the hold was even more evident, with virtually everyone having ties to what was called “King Sugar.” “We have the kind of village that everyone wants to live in,” says Julia. “As large as the entire island of O‘ahu, Ka‘u is big land and small community. Everybody knows everybody and everybody steps forward and volunteers. Pahala is safe, walkable and away from the highway. It has all the amenities of a regional center; a K-12 school—the center of the village both physically and energetically—a hospital, swimming pool, bank, post office, stores, restaurant and lots of open space. Punalu`u Black Sand Beach and Wood Valley are six minutes away and the village is surrounded by ocean, forest, mountains, ranches, macadamia orchards, coffee and vegetable farms. The list goes on and on,” she says with pride. Julia heard that a number of old teachers’ cottages located on the school grounds were going to be demolished and began looking for ways to save them, too. “Michael and I didn’t have any savings or backing, so we used our credit cards to buy land and move the houses, then leveraged the renovations into a mortgage,” she explains. They were able to save four of the cutest bungalows, each a duplex, and place them naturally on rolling hills near the center of the village. They are now part of their business, Pahala Plantation Cottages. Clubhouse on your left. This building and the bungalow next to it were restored with community volunteers and funding from the Edmund C. Olson Trust; the Clubhouse proves to be a perfect venue for community functions and visiting group retreats. Catty-corner to these buildings, on the other side of the peaceful and tree-lined, narrow roadway is another building that Julia and Michael restored. It is the old bank and now the home of a community radio venture led by local recording artist Demetrius Oliveira, of the band Ka`u. Just a little farther down on the mauka side at Maile and Pikake Streets is the recently restored Olson Trust Building, where Pahala Plantation Cottages reception, the new Ka`u Coffee Mill office, the Ka`u Calendar newspaper, Hawai`i Volcanoes National Park and Ka`u Main Street have their presence. On the makai side is the Plantation House. It is surrounded by trees and hard to see; plus, there are no signs letting you know—in gaudy 21st century fashion—that you have arrived. That there are no signs is part of the beauty of Pahala. “There are vacation rentals here in Pahala, but none of them have signage. When visitors stay here, they are considered part of the community,” says Julia. Their more recent save was once the Ka`u Meat Market, renamed Ka`u Market House, and is now a beautifully designed meeting house, with three bedrooms and space for a dozen or so people to meet around a long table or couch area. Tourism is low-key in the village, and it is kept at a good, sustainable level, which helps Pahala draw some very sophisticated visitors. “The world comes here,” Julia says, and begins the litany. Steve Chapple, writer with National Geographic Traveler came here to write Pahala, Hawai`i: The Last Aloha Region. “He comes back almost every year,” she says. Continued on page 32 Julia Neal wears many hats: preservationist, editor/publisher, innkeeper and Pahala/Ka‘u community proponent. Kitchen and Bath Remodels by Plumbing Strategies Inc. We Have an Excellent Service Department, too . and selected several boutique roasts from the local coffee farmers to French press and serve at his restaurants. A film crew from Canadian television’s Mantracker series, known for its search and rescue, came to the village, stayed at the Pahala Market House, met with local ranchers and hired the local cowboys, providing a nice bump in the Pahala economy for a few weeks—the beauty of Ka`u to be broadcast into 30 million homes this fall. The popular, annual slack key guitar/ ukulele masters’ workshop draws students from all over. Above, Keoki Kahumoku teaches a guitar class. Another concern of the village is preserving the longest uninhabited shoreline in the state, the Ka`u Coast. When Julia learned that coastal property between Pahala and Na`alehu could be sold for development, she and the staff of her monthly publication, Ka`u Calendar, funded and co-produced Saving Ka`u’s Coast, with filmmaker Danny Miller. They handed out the film on the opening day of the State Legislature, went to Washington to give it to members of Congress and showed it to the County Council. A gripping documentary, it was featured at the annual Oceans Film Festival in Santa Barbara. Along with the leadership of Trust for Public Lands and community organizers like John Replogle, founder of Ka `Ohana O Honu`apo, the film served as a valuable tool in helping the community to raise over $4 million to preserve Honu`apo. In the last decade, more than 1,000 acres along the Ka`u Coast have been transferred to public domain. Julia is a big promoter of Ka`u coffee. She took the Ka`u Coffee Growers Cooperative’s southern brew to Washington DC, where it became the official coffee at an Obama inauguration gala at the historic Hay Adams Hotel next door to the White House. It’s clear that she loves pointing out that coffees from individual Ka`u growers have become yearly award winners at the Specialty Coffee Association of America’s International Expo, beating out much bigger and more established plantations in Central and South America. “Most of Ka`u’s coffee farms are five to seven acres,” and a number of these are run by displaced sugar workers who “gotta make it,” shares Julia. To help farmers, the Olson Trust is nearing completion of a coffee mill on Wood Valley Road. reported in the Ka`u Calendar and online at www.kaucalendar.com, the monthly newspaper that pulls the vast community together by highlighting the “good news.” Julia – more cheerleader than editor – places a “microscopic focus” on the events in Ka`u, celebrating and documenting life in the district, and she maintains an objective viewpoint. Her next dream is the renovation of the old Japanese schoolhouse into the permanent Pahala Boys & Girls Club. While Julia dismisses the term “queen of serendipity,” a title sometimes given to her around Ka`u to distinguish her from an organized and shrewd business person, she does admit to being “an open person who enjoys the qualities of this historic place - and wants to help.” She illustrates perfectly, “that good things happen when you are in a good place.” v Email Ann Peterson at anncinzi@gmail.com. New York opera singer Amy Shoremount-Obra practices in the reception area of the Pahala Plantation House with pianist Carol Wong, prior to giving a recital there and teaching a class at Ka`u High School. Concrete Technology of Hawaii, Inc. I offer options that fit just about any family or budget. Don’t wait. Call me today. hen Huggo’s opened its doors in 1969, restaurateurs Shirley and Hugo von Platen Luder knew they had a prime spot for oceanfront dining in Kailua-Kona. Now in its second generation in the same family and the oldest restaurant in Kailua village, one might ask what is its secret for survival when so many others have closed and/or changed hands many times during a 40-year span. Location is king, but Huggo’s has stayed in tune with the times. It’s earned a reputation for fresh fish, a fun atmosphere and garnering numerous culinary awards; its owners are imbedded in community affairs; and, these days, the iconic restaurant is being noticed for its attention to social and environmental stewardship. Whether it’s cultivating its own produce organically, using “green” takeout cartons made from recycled products, or hosting a fishing tourney to benefit charity, Huggo’s is invested in making Kona a better place for living….and eating. at the garden and monitored to build soil,” explains the farm consultant who owns Hawai‘i Roots Down. Numerous herbs and leafy greens, plus beans, peas, peppers, sweet potatoes, taro and ti leaf are thriving in raised beds. “I touch base with Chef several times a week to discuss what’s ready for harvesting and any upcoming specials or events,” details Trujillo.” Huggo’s gets ulu (breadfruit), taro, sweet potatoes, bananas and citrus from Trujillo’s own farm and is also privy to a food availability list that encompasses other local gardens cultivated by Hawai‘i Roots Down. “Huggo’s has become an example for other businesses to invest in earth-wise efforts,” emphasizes Trujillo. “These efforts are proven to increase sales, reduce shipping and delivery costs, provide the consumer with fresh, locally grown organic food and help the environment.” Chef Arroyo says Huggo’s relies on an additional collection of “quality local food producers” to fill its pantry. The hearts of palm featured in the house baby greens salad are from Puna Gardens, the novel fern shoots, which are expertly prepared tempurastyle, hail from Hilo; while the ali‘i mushrooms in the herb-marinated chicken linguine are commercially grown in Laupahoehoe. “We use our own basil to make our macadamia nut pesto for the linguine,” chef adds. “We had already been doing a restaurant garden but decided to hire a professional whose expertise is produce and who follows sustainable, organic practices,” says owner Eric von Platen Luder. “It’s quite an investment and takes three years to go organic.” (for certification after prohibitive substances have previously been used). Huggo’s garden is at an elevation of about 1,000 feet above Kailua-Kona at the von Platen Luder home. Huggo’s serves Country Natural Beef (CNB), which Chef explains is a “consistent quality product” free of hormones and antibiotics. CNB is a co-op of ranches that subscribes to sustainable stewardship practices concerning land and animal management. After initially grass fed, CNB animals are finished for 90 days on grain, potatoes and hay at gathering feedlots. While Huggo’s beef has been sourced from CNB farms in the western Mainland U.S. and Hawai‘i, Chef says the beef will soon be coming solely from seven to 10 ranches in Hawai‘i. Recent efforts supporting sustainability include a new Hawai‘i Regional Cuisine menu that relies heavily on locally-sourced foods. The garden-to-table focus with small and large plate offerings debuted last fall under Executive Chef Konrad Arroyo, who joined Huggo’s in early 2009. Around the same time, Adam Trujillo, certified permaculture designer and member of the Hawai‘i Organic Farmers Association (HOFA), came on board to manage Huggo’s commercial urban vegetable garden. Continued from page 35 To insure Huggo’s doesn’t miss out on the freshest fish available, there’s a red phone in the kitchen known as the “fish hotline.” It’s dedicated to taking calls from fishermen who have justcaught fish to sell. The restaurant serves nearly 3,500 pounds of fresh fish each month—opakapaka, monchong, kampachi, moi, onaga, swordfish, ono, mahimahi and more. Pointing to a 150-pound ahi in the walk-in cooler, Chef says a butcher is on duty five days a week to “take care of the fish and proteins. It’s a chef’s delight.” Seafood is great for sharing with Huggo’s “small plate” portions. Choose from freshly caught sashimi or ahi tuna poke prepared with Maui onions, Hawaiian chili peppers, a poi vinaigrette and exotic chips. Snack on Big Island farm-raised Kumamoto oysters, Kona lobster-ulu cakes or ginger-steamed clams with crispy long rice. The daily Island fresh catch is prepared with sichimi togarashi (Japanese collection of seven spices) and served with a creamy, sweet-potato puree, Asian sprout salad and a lemongrass haupia sauce. Other “large plate” seafood favorites include the grilled mahimahi with kabocha pumpkin risotto and local garden beans or the sesame-crusted, seared rare ahi with Forbidden Black Rice and green papaya salad. Dessert at Huggo’s is sublime with the likes of ginger crème brulée and Pele’s Chocolate Tart. The towering chocolate cookie crust ice cream pies (choice of Kona coffee or mac nut) are an after-dinner must for many loyal Huggo’s diners. Fluffy haupia coconut cake is complimentary to anyone celebrating a birthday. “We support local businesses—Kailua Candy Company and Coffees ‘n Epicurea—by offering some of their desserts,” says Chef Arroyo. Supporting others—whether local farmers, businesses or people in need—has long been a philosophy for the folks at Huggo’s. Huggo’s on the Rocks was the first location for the island’s HIV/AIDS fundraiser, Taste of Life, which Eric founded a dozen years ago with Scott Dodd, CEO of Paradise Gourmet Catering and Susanne St. John, a former Huggo’s accountant. Huggo’s annual Wahine Fishing Tournament marks its 15th year on July 31 and this year benefits Family Support Services of West Hawai‘i. Since its inception, the sporting event has given away $150,000 to different local charities. For more information about “surgery with the delicate touch,” visit drjoangreco.com. Carter Professional Center 65-1230 Mamalahoa Hwy. The garden-to-table focus with small and large plate offerings debuted last fall under Executive Chef Konrad Arroyo, who joined Huggo’s in early 2009.
charitable causes. The voluntary involvement costs between $1,500-$2,000 to pay for food, a day of preparation and attendance by a chef and helpers. “Of course we benefit from these events from a marketing standpoint as we get to show off our food and it gives us the opportunity to get feedback on new menu items,” notes Eric. “But we live in a small community and I feel it’s important for all businesses to care for the community and help those in need.” Caring about what goes into the local landfill prompted Olu Kai, Ltd. to rethink its use of disposable products. Both restaurants and the catering division have switched to “green” disposables, sourced from Sustainable Island Products in Hilo. “These products are made from either recycled or sustainable materials that easily degrade and are made in an environmentally friendly way,” details von Platen Luder. “We are now foam-free.”  Located on Ali‘i Drive north of the Royal Kona Resort, Huggo’s opens for dinner at 5:30 p.m. daily, serving until 9 p.m. SundaysThursdays and until 10 p.m. Fridays-Saturdays. Dinner specials are posted on both Facebook and Twitter at 4:30 p.m. The cocktail lounge, where you can enjoy themed drinks like Da Green Flash and the party-sized Kilauea (served in a flaming bowl), opens 4 p.m. weekdays and 5 p.m. on weekends with nightly entertainment that includes piano and jazz. Dinner reservations recommended, 329.1493. FYI: Back by popular demand are Huggo’s famous BBQ ribs, a mainstay on the restaurant’s luncheon menu for over 30 years. The savory treat is served next door at Huggo’s on the Rocks every Thursday. Rocks opens 11:30 a.m. daily with lunch until 5:30 p.m., followed by dinner until 10 p.m. and cocktails until midnight. Nightly entertainment starts swaying with 6 p.m. hula and continues under the stars with the likes of Hot Lava 808 or Grammy-nominated LT Smooth or Donald Kaulia. Find daily lunch specials on Facebook and Twitter at 11 a.m. Info: 329.1493 or visit huggos.com. ave you sensed a feeling of change in the air lately? As 2010 marks the com	mencement of a new decade, Chinese astrology claims it to be the Year of the Metal Tiger. Increase focus and invite creative opportunity with an oval or circular mirror near the entrance. that may require us to have greater clarity, precise actions and focused determination in order to reap our rewards. Wisdom of the Five Elements for Efficient Living Similar in their fundamental viewpoints, both ancient Taoists and Hawaiians placed strong emphasis on harmony with nature as a standard of living and as a connection with spirit. They created systems and practices that help one to attune to nature’s cosmic forces for navigating through life with balance, wellness and prosperity. In the practice of feng shui, as well as in Chinese medicine, the five elements (wood, fire, earth, metal and water) represent the fundamental building blocks of all things in the physical universe. From this perspective, these elements (which are essentially movements of energy or vibrations) also exist within you and everything in your environment. By working with the balance of how nature’s elements flow within and around us, we can live in harmony and ride the Metal Tiger year into joyful success! To cut through distraction and refocus your energy on a creative project or business endeavor— Try placing an oval mirror on the inside left (as you are facing out) of your front entrance or your office door. This will open up ch’i flow and invite more energy for focused determination, inspiration and creative opportunities into your space. To enhance communication in your family, community or work relationships— Place a round table in your dining room, living room or office meeting area. The circular shape incorporates the metal element and enhances harmony, equality and clear communication. The fastest way to clear through blocks and regain inspired creativity in any project— Clean your space! Cleaning is a metal element activity and will help you to clear your mind, reestablish your left/right brain connection and invite fresh, vibrant energy into your workspace. Be sure to include polishing mirrors, metallic items, crystal and/or reflective surfaces that have become dull or dusty. This noble white tiger embodies the dynamic qualities of nature’s metal element and can give us clues into how to align with the astrological/energetic “weather map” for the present year. In understanding the placement of metal in the five-element energy cycle, we know it as the most yang (masculine) of all the elements. It is associated with clarity, brilliance, mental strength, and perseverance. The metal element represents the power of refinement from the heavens that creates the magic of synchronicity in our daily lives. It is the power of the blade that cuts through that which is not essential to get to what truly is of essence. Metal is the force of willpower and its great strength is used for the framework in structures and large buildings. Metal’s value is represented by the rich minerals, jewels and gems born of the Earth. Metal energy engenders a sense of mental clarity, inspiration, refinement and emotional maturity. When your metal energy is in balance you have a sense of being “in touch” with your feelings, as well as a sense of maturity that helps you to be honest and courageous in achieving your goals. Metal’s refining energy helps us to let go of the disappointment of the past and move forward with clarity and newfound ingenuity. Feng Shui and the Metal Element The life force energy, or ch’i, that flows through your environment is the same energy that flows through you. Feng shui, like acupuncture, works to balance and optimize the ch’i flow through your home and workspace. It is a very sophisticated, ancient system that profoundly helps to optimize the quality of ch’i flowing through your space and, ultimately, through every area of your life. With feng shui, you can incorporate the energy of the metal element into your space for increased creativity, inspiration and joy.  Email Marta Barreras at marta@aloha.net. Looking for something new to enhance your life? Call now for early registration ! The Life The mill roasts its own coffee, in addition to private labels for other Hilo, Hamakua and Ka‘u estate farms. Continued from page 41 was a success, but the two women knew they had to take it to another level. They gutted and rehabbed an old karaoke bar in the Hilo Shopping Center and named it Kope Kope (Kope means coffee in Hawaiian.) They created an intimate space for people to gather, drink coffee, work on their laptops and listen to local musicians. 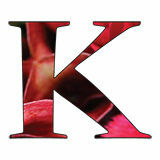 20% Discount on final cost with mention of KeOla Mag. MATERNITY, PARENTING, BABY, CHILD, SURF, SUN, and so much FUN! Mod Mama, Beach Babe, Million Dollar Baby Furniture, Petunia Pickle Bottom Bags… we have it here for you plus lots more! all your baby rental needs! In February of 2001, desperation for finely roasted coffee led the partners to create a coffee roasting facility in the Shipman Business Park. There were seven original founders in the business, five remain today. Of those, four had more than 20 years of coffee farming and processing experience. One was a graphic artist who designed the company logo, featuring seven leaves and seven coffee cherries, symbolizing the seven founders. It was there that they perfected the fine art of roasting and established standards of properly roasted fresh beans. For three years they juggled both the retail café and the roasting business as word spread about their fine roasted coffees. Finally in 2004 the pair sold Kope Kope and dedicated themselves to roasting and eventually growing fine coffee. Their dream grew and they bought the property that would eventually become what is now the Hilo Coffee Mill. Today, it is East Hawai‘i’s largest coffee mill and is growing in reputation as a destination for visitors, who eventually become mail order customers. The mill not only grows, but also buys local coffees from around the state of Hawai‘i. All green beans purchased must meet the standards of 100 percent, pesticide-free beans. The mill also advises its approximately 40 estate growers on the varieties of coffee to plant and the proper types of fertilizer to use at various points of the growing season. Visitors to the Hilo Coffee Mill may also partake in one of two different tours. There is the abbreviated, free tour, which shows people how the coffee is grown, harvested, hulled and roasted, or a more elaborate, customized tour with luncheon. All tours offer free tastings of the mill’s roasts in the Latte Da Bar at the Mill, which features the original kiosk where the business had its beginnings. The café offers far more than just coffee and teas. Lunches and to-go menu items round out the offerings and there are always sweets and pastries available as well as locally-made Hilo Homemade Ice Creams. Naturally the most popular flavor is the 100 percent Ka‘u Coffee Ice Cream. Another popular treat is called “Black Eye.” It is a scoop of the coffee ice cream with an indentation that holds a shot of espresso. Lots of locally made items fill the shelves of the store, along with coffee beans and teas, soaps, coffee and espresso makers, grinders, roasters, burlap logo bags, gift items, music, candies and logo wear. Many of these items are also available in their online store. The mill is also becoming famous for the local staple, Portuguese bean soup. With days at Mountain View cooler and wetter than on the coasts, the soup makes a soul-warming afternoon meal. In December 2009, the Hilo Coffee Mill started a new 100 percent local Farmer’s Market on Saturday mornings. A hot breakfast is available for $5, featuring a special breakfast each week. Some offerings are teriyaki steak and eggs, Portuguese sweet bread French toast, breakfast burritos and other special breakfasts. If you subscribe to the mill’s newsletter, you will get an e-mail informing you of what will be at the market each week, including the breakfast. While the market is still growing, there is a full complement of local produce, micro greens, flowers, hearts of palm, breads, fresh pastas, plants, furniture, koa crafts, rotisserie chicken, local honey, rabbits and much more. The mill sells produce from its gardens, beautiful eggs, special salsa, coffee maple syrup, coconut candy and breakfast cooked to order. Live music rounds out the day. Hours are Saturdays from 7 a.m. till noon.  For more information: www.HiloCoffeeMill.com M-Sa 7-4 17-995 Volcano Road Mountain View, HI 808.968.1333 Email Devany Vickery-Davidson at pineappleprincess@hawaii.rr.com. A passion for East Hawai‘i-grown coffee inspired Jeanette Baysa (left) and Katherine Patton to establish Hilo Coffee Mill and oversee its growth from a kiosk in the shopping mall into East Hawai‘I’s largest coffee mill—a grower, processor, store, café and farmers market in Mountain View. Business Tax Issues? √ Business Tax Returns √ Payroll Tax Returns √ W-2/1099 Filings Make sure you are in compliance! Mention this ad for 20% off a one-hour consultation. Bolo is a modern day Renaissance Man, with simultaneous passions for art, music, community, green-oriented clothing, recycling, the ‘aina, ‘ohana, spirituality, children’s education, design and the desire to share these things with the world. olo Mikiela Rodrigues, or “Bolo” as he is best known, greets me at the gate of his family home— which also serves as his design workshop and inspirational hale— with a friendly smile and an affable, ”Howzit?” I see a hip-looking ‘61 Ford Falcon wagon and an older Toyota truck nearby—both sun-bleached, sturdy cool, green-oriented, unpretentious and completely operational, much like the subject of this article. An accomplished Big Island musician and businessman, Bolo has “been there, done that” (and designed those t-shirts). He’s rubbed elbows with Hollywood stars, written Grammy and Hoku-nominated songs and gone through difficult times both in his home state of Hawai‘i and in the uncertain, darker world of the California rock-n-roll circus. I was struck with how his life seems to be the equivalent of an elder, yet wiser bluesman. He’s dealt with love problems, drug abuse and alienation and always come through as wiser, stronger and gratefully aware—a survivor, rising Phoenix-like from the ashes. With finches providing a pleasant musical soundscape and the sun beating down on the Toyota and Ford, we sit under the shade of the carport and talk story. CJ: Folks might have seen you around the island with one of your trademarks—a uke and guitar played together at the same time. Can you tell our readers how it happened and do you have a name for this? It is called Ukeitar— a funny word that makes people laugh and kind of describes the two instruments together. My love for both is strong. As there are always two sides to everything—yin and yang, balance and harmony—so too these instruments. One day, after being fed up with the band thing, I was staring at my guitar and uke in their separate stands, and wishing that they could become one instrument. It was a puzzle that fit perfectly and is held together by Velcro, patent pending (laugh). Hardest part of playing without stopping is timing. After three years it’s second nature, but not without a lot of practice. CJ: That instrument might be a metaphor for your life, balancing art and music, ‘‘ukulele and guitar, island music to heavy metal and back again. How did it all start? I kept practicing the ‘ukulele, and around 8 years old, I won a couple of talent shows. My mom really wanted me to learn guitar, especially slack key style. So she took me to my uncle where I learned a few songs and some different tunings. My mom’s Hawaiian, with family ties to Kekaha Kai or Mahaiula. I’m also part Puerto Rican, from my dad’s side. CJ: You also have a business in screen printing—BoloInk. How did that interest develop? In art class senior year we learned about T-shirt printing and, when I starting doing custom designs for the other students and making money at it, I knew that was one of the things I wanted to do as a business. Back at Kealakehe Elementary School our music class had ‘ukulele studies, which I did not excel at because I often created my own music rather than what was academic. Inventing or composing music came relatively easy for me, but it was frowned upon, as was my art, where I would paint trees purple and dogs and cats silver and gold. Continued from page 45 As soon as I graduated high school I moved to Maui and interned with a guy I met who had a T-shirt company. There I designed a line of T-shirts called “Big Boyz.” The owner took these designs to a couple of stores and they began selling a lot! But I never saw any money even though it had been promised. I would see people wearing these all over and one day I went into one of the stores, introduced myself to the owner as the creator of Big Boyz designs and shared my story. He advised me to start my own business and helped me hook up with a buyer at a big retail store on O‘ahu. Flying to the big city for a meeting on my own, straight out of high school, was nerve-wracking but also exciting, and I had my first order of 2,000 shirts. A very big first order! Then I had to figure out how to print them. I moved back to Kona and my ‘ohana pulled together to raise the funds. I bought a “how to screen-print” book and the equipment, while working out of the garage at home. As the orders became bigger, I needed a shop so I moved to the industrial area. My company was growing fast, but at the same time personal relationship problems were happening. The combination was very hard at that time. My relationship was over and my business was going too. I was angry and searching. This is when I felt music calling me, my only friend who really understood, never judged and was there day or night. I love all types of music, not only from instruments, but from the music of birds, waves, wind and nature. This is when I started to explore the world of angst through heavy metal music. Teaching myself how to play from books about fast-picking, heavy metal, heavy crunching and distorting sounds, I bought my first electric guitar. I was on my way to becoming the next Van Halen, just a Puerto RicanHawaiian version. Rush ‘um and Give ‘um. You see I didn’t and still really don’t know music theory and chords. Eventually I got better and I wanted more of everything—the limelight, MTV, Hollywood, glamour, bling, everything superficial. So I moved to California (laugh). By this time, my business was done and all I wanted to do was get away. My sister lived in Sacramento so I figured that was as good a place to start as any. As soon as I got off the plane I wanted to start playing music. I asked my brotherin-law where I could go and he took me to a hole-in-the-wall place to jam. I was asked to join a blues band called Desperados. I felt desperate at the time, so this seemed to fit. Playing with them I learned a lot, not only songs by Jimi Hendrix and Stevie Ray Vaughan but branching out with my own songwriting and style. CJ: So you went from the blues to heavy music like Rage Against the Machine and Papa Roach. That’s quite a transition! Did your band do the LA grind? Yes, I started to learn that most of what I had heard about the music industry was true. Back stabbing, two-faced etc. It was truly a learning experience. At the same time back in Hawai‘i my mom was really sick and I began to question what I had been chasing for eight years. I didn’t feel like the music I was playing was right for me and that my ‘ohana and Hawai‘i were calling me back. CJ: That takes courage and sense to walk away from a negative situation. Is that when you went back to screen printing? CJ: That’s a big change from the laid-back, island style. Then you joined a band? Yes, I moved to Hilo, where I had some family and friends and I went back to screen printing. I asked an uncle to be my partner and we started a shop called BoloInk. Business came almost right away, but I was missing music. One day at a coffee shop called Kope Kope, I asked the owner about doing T-shirts as well as music. I got both jobs. CJ: I understand that our mutual friend, Mati Laino, helped introduce you to some Hilo musicians, including Uncle Skippy. Were you reintroducing yourself to Hawaiian music at this time and where were you playing? I did T-shirts for the band MoeMoeA, I met Mati, then the rest of the boys. I came back to my roots as part Hawaiian, part Puerto Rican, and began getting closer to becoming the whole me. CJ: After your mother’s passing, you moved back to Kona and met some other inspiring people. Can you tell the readers about your experiences with them and how this led to your vision of Creating Ha? After a couple of years back in Hawai‘i, my true sound started to evolve. I wanted to find a connection to the next level of musical artistry, fusing everything I learned previously till now and to share it with people. I stopped worrying about superficial things and began to make a change inside. I met a slack key, finger-style player by the name of Chris Yeaton. He’s my age and has a company called Woodsong acoustics, a group of exceptional guitarists all across the country. I had sent him a demo of my fusion slack key and he called me. We became friends as well as fellow musicians. He asked if I wanted to go on The designs created by Bolo on screen-printed clothing he says are created in the hope of spreading awareness about sea creatures and the importance of taking care of the ocean. He is also working on dyes created from spirulina (blue-green algae) and squid ink, soy and other types of organic, eco-friendly types of products. CJ: Can you elaborate on Recycle Hawai’i and the character KOA that you have created for children? KOA - Kids of Aloha – is an ambassador character I created for Recycle Hawai‘i that offers eco- minded news for their newsletter, coloring and comic books that deal with social and environmental issues as a learning tool. CJ: What plans do you have for the rest of 2010 and for the future? The dark days are long gone, remembered and wisely avoided, replaced with a bright, focused vision for himself and the world that he graciously lives in. Bolo has come full circle, back to his roots, with an inner strength and desire to share, “Creating Ha.”  For further information about Bolo’s music, art, CD’s and clothing, visit www.creatingha.com Email Colin John at transpacificblues@yahoo.com. I am working on a screen play about my family, Kaelemakule; and “Creating Ha,” the play, with orchestrations. Also KOA for Recycle Hawaii and a series of learning tools for the keiki, plus Creating Ha, an organic clothing line. A new CD of Latin guitar and Ukeitar, as well as a new CD of singer-songwriter music is in the works. And just being involved with the positive projects and kokua, whenever possible moving forward, imua. I try to be a vessel for good works that nature can flow through, using whatever talents I can offer. Mahalo Ke Akua. Hawai‘i Island Farmers Markets East North Saturday: North Kohala. Across from Hawi Post Office, under the banyan tree. 7 a.m.–noon Saturday: Waimea Hawaiian Homestead Farmers Market. Hwy. 19, two miles east of Waimea town. 7 a.m.-noon. First Saturdays celebration with additional vendors, program. Saturday: Honoka‘a Farmers Market. Honoka‘a town near Honoka‘a Trading Co. 7:30 a.m.
Tuesday, Friday: Kekela Farms Organic Farmers Market. 64-604 Mana Road, Waimea. 100% organic. 2-5 p.m.
Sunday: Laupahoehoe Farmers Market. Next to the MinitMart on Hwy. 19. 9 a.m.-1 p.m. Saturday: Kino‘ole Farmers Market. Kino‘ole Shopping Plaza, 1990 Kino‘ole St., Hilo, 7 a.m.-noon Saturday: S.P.A.C.E. Farmers Market. S.P.A.C.E. Performing Arts Center, 12-247 West Pohakupele Loop, Pahoa. 8–11:30 a.m. Saturday: Hilo Coffee Mill Market. Ave., downtown Hilo. All local produce; plus breakfast. 7 a.m.-noon. Saturday, Wednesday: Hilo Farmers Market, Corner of Mamo and Kamehameha Ave., downtown Hilo. 7 a.m.
Sunday: Pahoa Farmers Market. Luquin’s/Akebono Theater parking lot. 8 a.m.–3 p.m. Sunday: Maku‘u Farmers Market. Kea‘au-Pahoa bypass road. 8 a.m.–2 p.m.
Saturday: Waikoloa Village Farmers Market. Waikoloa Community Church across from Waikoloa Elementary School. 7:15 a.m. Sunday: South Kona Green Market. Locally-grown produce, food and live music. Amy Greenwell Ethnobotanical Garden, Captain Cook (Across from Manago Hotel). 9 a.m.- 1 p.m. Phone 3288797 or visit www.skgm.org. Wednesday: Keauhou Wednesday Market. All locally grown or made. Lawn at Sheraton Keauhou Bay Resort. 8 a.m.-noon Wednesday-Sunday: Kona Farmers Market. Corner of Ali‘i Drive and Hualalai Rd. 7 a.m.-4 p.m.
May Saturday, May 1 May Day is Lei Day Waikoloa, Hilo, Volcano This annual 50th State holiday celebrates the symbol of aloha with island-wide festivities. program—also features live Hawaiian music and silent auction. 11:30 a.m.-2:30 p.m., Coconut Island at Hilo’s Queen Lili‘uokalani Park, Banyan Drive. Fee. 808.935.7393 or visit www.southhilorotary.com. Waikoloa: Waikoloa Beach Resort offers live entertainment, authentic Hawaiian arts and crafts, hula halau, lei-making contest and Lei Queen. 808.886.8822 or visit www.waikoloabeachresort.com. Sunday, May 2 Temple Fund-Raiser Bazaar Honalo Daifukuji Soto Mission hosts a building fund bazaar 9:30 a.m.-1:30 p.m. on temple grounds in Honalo, next to Teshima’s restaurant. Food, fresh produce, plants, household items, books and clothing for sale and entertainment provided by Kona Daifukuji Taiko. 808.322.3524 or visit www.daifukuji.org. Hilo: “He Mo’olelo o Ka Lei” features Hawaiian music by well-known entertainers Buddy and Sammy Fo, hula, lei-making demonstrations and the heritage, history and culture of the lei. 11 a.m.- 4 p.m. at Kalakaua Park in downtown Hilo. Free. 808.895.0850 or visit www.LeiDay.net. • On Sunday, May 2, the Palace Theater in downtown Hilo celebrates the Hawaiian art of lei making with “May Day Mele.” A spectacular lei display, lei contest, silent auction, “hands-on” demonstrations, live music and hula with local Hawaiian musicians, plus historic slides and short films with master lei makers. 1- 4 p.m. at the Palace Theater. Free. Visit www.hilopalace. com or call 808.934.7010. Tuesdays, May 4, 11, 18 Conscious College Movement Hilo A local variety show at Hilo Burger Joint for anyone who would like to join in or just enjoy the show. (Every Tuesday) Dancers, musicians, comedians, actors, all welcome. 8 p.m.-10:30 p.m. and all ages. www.consciouscollegemovement.com. Friday, May 7 Frank DeLima Concert Hilo The annual Mother’s Day Concert stages DeLima with his zany parodies, outrageous sense of humor and spontaneous creativity. 7 p.m. at Hilo’s Palace Theater. Tickets $20. 808.934.7010. Friday & Saturday, May 7 & 8 Orchid Fantasia Kailua-Kona Kona Orchid Society’s Annual Show and Sale attracts orchid lovers and Mother’s Day shoppers to find a wide selection of island-grown orchids, including new hybrids, exotic species and varieties to suit all Big Island microclimates. Classes on orchid cultivation are scheduled both days. 10 a.m.-6 p.m. May 8; 8 a.m.-6 p.m. May 9 at Hale Halawai. Free. 808.939.9282. Volcano: A family event celebrating Lei Day for all ages with lei-making demonstrations, lei contest and display, hula and ‘ukulele performances, talk-story sessions, guided tours of the native forest and more. Lei contest is open to all ages and cash prizes are awarded for outstanding entries. 10 a.m.-3 p.m. Free. Volcano Art Center in Volcano Village. 808.967.8222 or visit www.volcanoartcenter.org. time learning about the local landscape and seeing a seldom-visited locale. 808.769.7629. Continued from page 49 Saturday, May 8 “Mama…my Mama, I Love You” Keauhou A Mother’s Day hula and concert celebration in the ballroom at the Sheraton Keauhou Bay Resort & Spa. Entertainment by the halau, music by Weldon Kekauoha, Lorna Lim, Napua Greig and others, with mistresses of ceremony Skylark Rossetti and Penny Keli’i Vredenburg. The $40 ticket helps underwrite expenses for halau participation in the Queen Lili’uokalani Keiki Hula Competition. Silent auction, food and beverages. 5-9 p.m. 808.322.6141 or e-mail flowerswithaloha@aol.com. Saturday, May 8 Native Species Art Hike Volcano This unique hike is for amateur and professional artists of all ages who plan to submit artwork for the juried show, Hawai‘i Nei 2010. This hike visits the Kahuku area of Hawai‘i Volcanoes National Park. Participants should bring water, lunch and come prepared for wet weather. 8 a.m.- 2 p.m. Limited to 10. Free. To sign up, call 808.967.8222. Unique Gifts, Jewelry, Crystals, Incense, Meditation Supplies & Much more!  H A P P E N I N G S  with the public and local chefs. Also on tap is entertainment gifts and goodies. 10 a.m.- 5 p.m. at Kea‘au Shopping Center. 808.935.6464. Mann, Ph.D. With live drumming! 1-4 p.m. For more info, call 808.345.0050. Visit www.kalani.com and www.maryamann.com Saturday-Sunday, May 22-23 “In the Field:” Nature Photography Hawai‘i Volcanoes National Park Join award-winning photographer Jack Jeffrey for inspirational sessions of photographing Hawai’i’s native flora and fauna. Various aspects of nature photography discussed will include equipment, exposure, composition, lighting and close-ups. 8 a.m.- 3 p.m. Fee. Hawai‘i Volcanoes National Park. Call 808.985.7373 or visit www.fhvnp.org. Tuesday, May 25 Tsunami Talk Story Hilo “Unstoppable! The Spirit of Hilo,” an annual Tsunami Talk Story Festival, tells tales of Hilo businesses that survived the tsunamis of 1946 and 1960 and continue to thrive today. 6-9 p.m., Sangha Hall. $30 includes dinner. 808.935.0926 or visit www.tsunami.org. May 25 –May 31 Western Week and Rodeo Honoka‘a Popular annual celebration featuring Saturday Paniolo Parade with an agricultural festival, kids’ activities and exciting contests; Paniolo Barbecue and giant Block Party with live Country Western dance music, a live auction and live Saloon Girl Contest and Rodeo on Memorial Day weekend. Call 808.885.5580. Thursday, May 27 World Premiere of “Rx the Movie” Hilo This full-length movie was written, directed, filmed and edited by 18-yearold Jesse Tunison of Volcano, who started the project produced by Kea`au Youth Business Center as a 16-year-old. The story follows teens who get mixed up dealing prescription drugs in Hilo and the dire consequences of their actions. 7 p.m. at the Historic Palace Theatre with a reception to follow in the lobby. $5 Visit www.hilopalace.com or call 808.934.7010.
informal talks near the fireplace in the Volcano Art Center Gallery at Hawai’i Volcanoes National Park. 7 p.m. Free, park entrance fees may apply. 808.967.8222 or visit www.volcanoartcenter.org May 29-31 Inter-Tribal PowWow Hilo Everyone is invited to experience the sights, sounds, flavors and spirit of Native America through music, dance, storytelling, food, arts and crafts at this free, family-oriented event with opportunities for audience participation throughout the weekend. At Wailoa River Park. This is a drug- and alcoholfree event. Visit www.hilopowwow.com or phone 808.557.8607. June Saturday, June 5 Ford Ironman Hawaii 70.3 Triathlon Kohala Coast It’s half the Ironman distance – 1.2mile swim, 56-mile bike and 13.1-mile run – and is headquartered from the Fairmont Orchid, Hawaii. The race is an official qualifier for the 2010 Ironman Triathlon World Championship this fall on the Big Isle. 808.329-0063 or visit www.ironman.com. Saturday, June 5 The Brothers Cazimero Waimea The Brothers Cazimero’s annual concert wraps up the Kahilu Theatre season with lots of Hawaiian- style fun. Enjoy hula, singing and talk story. $45/$40. 8 p.m. Kahilu Theatre, Waimea. 808.885.6868 or visit www.kahilutheatre.org. ival. mehameha Fest of the 2010 Ka rt pa e a ar t Ho a en al ainm a I, Mām Hula and entert of Kamehameh of Royal Order sy te ur co o ot – Ph (Hilo Chapter). Friday, June 11 North Kohala King Kamehameha Day Celebration Kapa‘au Come to the northern tip of the Big Island to honor the legendary Hawaiian king in his North Kohala birthplace. A full day of festivities includes 8 a.m. ceremonies and lei-draping of the King’s original statue in Kapa’au, a traditional floral parade with flowerdecked pa’u riders representing each Hawaiian island, plus an afternoon of music, hula, crafts and food in Kamehameha Park continuing until 4 p.m. 808.884-5168. Friday, June 11 Anniversary Art Show Kapa‘au Opening of “Paperworks 2010” show featuring paper sculptures, screens and wall hangings by Susan O_Malley. Celebrating one year anniversary of Living Arts Gallery in Kapa‘au. Call 808.889.0739. Saturday, June 12 King Kamehameha Day Parade Kailua-Kona A beautiful floral parade through the heart of Kailua-Kona honoring the great Hawaiian monarch. Featuring Hawaiian-themed entries, including p‘au riders representing all the Hawaiian Islands, bands, hula and community groups. Also food booths and crafts. Parade steps off 9 a.m. in Kailua Village. Kamehameha I (c. 1758–May 8, 1819), also known as Kamehameha the Great, conquered the Hawaiian Islands from his home and base on the Island of Hawai‘i, and formally established the Kingdom of Hawai‘i in 1810. By developing alliances with major Pacific colonial powers, Kamehameha preserved Hawai‘i’s independence. Kamehameha is remembered for the Kanawai Mamalahoe, the “Law of the Splintered Paddle,” which protects human rights of non-combatants in times of battle. His full Hawaiian name is Kalani Pai‘ea Wohi o Kaleikini Keali‘ikui Kamehameha o ‘Iolani i Kaiwikapu kaui Ka Liholiho Kunuiakea. Historical sites on the Island of Hawai‘i associated with King Kamehameha I: Birthplace of King Kamehameha. At the northern tip of North Kohala, near ‘Upolu Airport and Mo‘okini Heiau is Kamehameha Akahi Aina Hanau, the alleged birthplace of Kamehameha the Great, who is said to have been born here in 1858, as Halley’s Comet passed overhead. Naha Stone. In front of Hilo Public Library. Kamehameha lifted the Naha Stone at age 14. The legend (similar to that of King Arthur) said that the man who lifted it would be a legendary warrior who would unite all of the islands. ‘Ahu‘ena Heiau. After about 1812, Kamehameha spent his time at Kamakahonu, a compound he built in Kailua-Kona. His personal heiau has been reconstructed on the grounds of King Kamehameha’s Kona Beach Hotel. Statues of King Kamehameha. Five statues exist, each varying slightly. The original casting commissioned by King David Kalakaua—while being transported by ship bound for Honolulu from Europe—sank off the Falkland Islands. After a new one was built to erect in Honolulu, the original was salvaged in 1912, repaired and erected near Kamehameha’s birthplace in Kapa‘au. booths. 10 a.m.-5 p.m. at Moku Ola (Coconut Island). Free. 808.989.4844 or visit www.kamehamehafestival.org. A no-alcohol, no-drug event. North Kohala celebrates King Kamehameha Day by decorating the historic statue near tthe king’s birthplace. Pu‘ukohola Heiau. National Historic Site next to Spencer Beach Park. Completed in 1791 near the village of Kawaihae on advice from a respected kahuna (priest) named Kapoukahi, who suggested the building of a luakini heiau (sacrificial temple) to gain the favor of the war god Kuka‘ilimoku. Pu‘ukohola Heiau, meaning “Temple on the Hill of the Whale” was built entirely by hand with no mortar and stones transported by a human chain about 14 miles long, from Pololu Valley to the site. Construction of this largest heiau in the state of Hawai‘i was supervised by Kamehameha’s brother Keli‘imaika‘i, involving thousands of people. Damaged by the earthquake of 2006, the heiau is undergoing repairs. Ali‘i Drive is closed to traffic and lined with friendly vendors, merchants and restaurants offering a wide variety of specials from 1-6 p.m. At 4 p.m., enjoy hula by Halau Na Pua Ui o Hawai‘i and a free Hawaiian music concert on the lawn at Hulihe‘e Palace honoring King Kamehameha I. Bring your own mat or chair and they will be checked for free while you stroll Ali‘i Drive. 808.329-1877; www.daughtersofhawaii.org. Sunday, June 21 2nd Annual “Run Forrest Run” Kailua-Kona Sponsored by Bubba Gump Shrimp Co. and the Kona Marathon, these Keiki Fun Runs are headquartered from Hale Halawai County Park on Ali‘i Drive in ly downtown Kailua-Kona. th on m e fre g ‘e Palace durin A day of fun for the whole Hula at Hulilhe Gavelek –Photo by Fern family. Children ages concerts. 1-14 can participate in age-specific runs/walks. All entrants receive t-shirt, Friday, June 18-Saturday, July 3 finisher ribbon and goodie bag. Entry Geppetto & Son fee $10. Register at Bubba Gump’s or Kainaliu online at www.konamarathon.com. The Aloha Performing Arts Company presents Disney’s “Geppetto & Son” at the Aloha Theatre. Shows are 7:30 p.m. Fridays and Saturdays and 2:30 p.m. Sundays. “Geppetto & Son” is a musical retelling of “Pinocchio,” from the point of view of Geppetto, his creator. This is a family-friendly show and casts mainly children. Tickets are $10-$15 at the Aloha Theatre in Kainaliu. 808.322.9924 or apachawaii.org. Friday, June 25 NELHA Fish Market Keahole-Kona A marine culinary celebration, here’s your chance to see – and buy – ecofriendly aquaculture products grown in the cold water at Hawaii’s Natural Energy Lab, such as lobster, crab, abalone and fish. Live music, farmer/ chef demos. 2- 6 p.m.; Hawai‘i Gateway Energy Center building. 808.938.1017.  H A P P E N I N G S  5-K and 10-K runs. Headquartered at the Outrigger Keauhou Beach Hotel. Visit www.konamarathon.com or e-mail raceinfo@konamarathon.com. Kailua Bay (8:30 p.m.). 4 p.m.- 10 p.m. Coconut Grove Shopping Center. Visit www.konaparades.com. (Hawaiian cowboys) vie 9 a.m.-noon at the Parker Ranch Arena in Waimea. 808.885.5669 or visit www.parkerranch.com. Sunday-Monday, July 4-5 Anuenue Freedom Festival Pahoa A 10-day event celebrates the “independent spirit” of Puna, culminating in a Freedom Day July 4 from 6 a.m.-10 p.m. with games, sports Eco & Art Trek, food and fireworks, plus a Ho’olaule’a Holiday on July 5 from 11 a.m.-9 p.m. with various Hawaiian culture themed activities such as hula and lu‘au. Kalani Oceanside Retreat in Pahoa on Hwy. 137 between mile marker 17-18. 808.965-0468 or visit www.kalani.com. Sunday, July 4 Turtle Independence Day Kohala Coast Held purposefully on July 4th, this event educates attendees about endangered Hawaiian green sea turtles. Watch as the young honu (turtles), which have grown up in the ponds at the Mauna Lani Resort, are given their freedom as they are released back into the ocean. Call the Mauna Lani Resort at 808.885-6622. Tammy Sullivan and pal Duke with a display of gift baskets. amarra (Tammy) Sullivan has listened to visitors’ requests for gifts to take home from the Big Island for more than 30 years. “I feel I know what makes people remember Hawai‘i and I want to put it all in a basket for them,” says the owner of Hawaii’s Gift Baskets, who has worked in the hospitality business since coming to Hawai‘i more than 30 years ago. Tammy and Carole Carraway started the business in 2007 to answer what they saw as the need for a “one-stop shop.” “We both wanted to create a successful business that would showcase the finest Big Island products in creative islandinspired baskets,” she says. Carol eventually left the business. Tammy still focuses on customer service and works hard to “gather all the finest Big Island products in one location,” always searching for something novel and new to offer customers. If a customer has a special request, she’ll always try to fulfill it. “Aloha can be always found here,” she says. They deliver locally and ship anywhere. The products included in their gift baskets are made mostly by small, local businesses and include such items as candies, coffee, mac nuts, local wines and brews, flowers and other treats. They are combined in themes for birthdays, weddings, lu‘au, corporate giving and holidays. The basket or package is part of what makes the gift special, Tammy says. “All of our packaging—from the hand-decorated, Hawaiian lauhala boxes and lavish arrangements, to festive lunch bags—make the perfect keepsake when all the goodies are gone!” For details, phone 808.329.2300 or visit www.HawaiisGiftBaskets.com. arbara Ann Kenonilani Moore’s mission in life since the early 1970s has been to create a nurturing environment called The Dragonfly Ranch: Healing Arts Center. The year 1974 was marked by two accomplishments that were significant to her. She learned lomilomi massage from the worldrenowned kahuna haha, the late Aunty Margaret Machado, and became the steward of an acreage in South Kona near Pu‘uhonua O Honaunau. The business moved from its original location in Holualoa to a convenient shop at 74-5617 Pawai Place in the Old Industrial Area, across from the Kona Brewpub. Both visitors and residents find a need for gift baskets, says Tammy, and they can order from the website, too: www.HawaiisGiftBaskets.com. Barbara Moore (right) and her mentor, Aunty Margaret Machado. he first time I saw the Kona Coast of Hawai‘i, it was all dressed up in early December. Hillsides exploded in blood red poinsettias and wild yellow daisies cascaded over rocky cliff edges, reflecting daylight like small solar flares. Avocado and papaya hung pendulously from their trees like huge testicles. There was an insistent sensual fecundity everywhere, creating almost too much stimulation. I was in awe of it all. I had just come from a gloomy landscape, where the skeletal gray fingers of leafless trees scratched against a pale sky, and everything shivered and hunkered and waited. Suddenly I was in a place that was bursting with warmth and growth and energy. Windows were open and the world seemed to be smiling. The magnificent canopies of monkeypod trees stretching over the roadway, the brilliant orange and golden blossoms of African tulips and the white snow bushes flashing their purity. Then, the bananas! Oh, the relentless bananas; giving birth all year round to weighty hands of fruit! I did not know then, as I drove beneath their massive green folds, that they would grow like weeds and someday swallow my little Hawaiian cottage. I believed that the bananas were trees, like peaches or apples. I expected them to give fruit each summer and then sit quietly and wave their lovely leaves like flags in the breeze as a decorative member of the garden. Be warned, however, before planting bananas; they are actually perennial herbs! Not only do they tower above the rest of the yard and grow so heavy with their pregnant inflorescences that they threaten to topple over before ripening, but they simultaneously give birth to “keiki,” sprouting at the base of the parent and increasing the size of the grove exponentially. The main plant dies as soon as it fruits and needs to be chopped down or it will putrefy and slowly turn to stringy mush. Neighbors, I learned, tend to frown on those of us who are lazy about our bananas. A yard that is infested with the rotting corpses of the plants can look less than tidy and smell a bit too much like green cheese. Harvesting bananas is a physically demanding job and should always be done while wearing only your “banana clothes,” because the sap gushes out of the plant and permanently stains you. Wrestling with bananas leaves you looking as though you had been splashed by a passing asphalt truck. Trying to saw the heavy fruit free of the stalk and catch it before it hits the ground can be a dangerous dance and the plant is spitting black goop at you during the entire performance. I have lived in Hawai‘i for eight years now, amassing an entire wardrobe of banana clothes. Bananas don’t grow on trees, I know now, and they are a constant reminder of my early innocence, as my dreams of tropical life began to come into contact with its realities. Life on the South Kona Coast is a journey of constant learning. My simple existence here has produced a contentment and a sense of peace that I cannot imagine finding anywhere else on this planet. I was at home here on that very first December day and I am grateful beyond words for finding this paradise, where I can feel warm sand between my toes every single day of any year. The island keeps reminding me to watch and feel and be in the present moment. I have my consistent lapses and allow myself to be distracted by a political issue or a social injustice or the painfully slow progress of an important improvement. But over time, the sensual stimulants win and I spend most of my days positively involved with my amazing surroundings. I can imagine no more pleasant duty than that of harvesting a sticky and unwieldy bunch of bananas on a lazy Kona afternoon. v Big Island author Rocky Sherwood’s books, Meanderings of a Twisted Mind and In Poseideon’s Pocket can be purchased at www.rockysherwood.com. Email her at rocky-ra@hawaii.rr.com.